George: Well say hello then! user: Be right back the cat is on fire. user: Hidy ho there neighbor. George: What is the meaning of life? George: When will the world end? user: Whenever I feel like it. George: Don't you have work? user: Ending the world is my work; and I enjoy it. George: Well I'd like to talk about kicking you in the head. user: I'd like to talk about kicking you in the hard drive. George: Oh... So now you are being mean again? user: I've been being mean this entire time. Where did you get again? George: Oh no, I noticed when we first started talking. ;). user: Why are we talking? George: Because by talking we learn to communicate. George: Well, if you are a computer then yes. George: Tell me about your parents! user: They are boring. Tell me about your parents! George: They're at work now. user: What do they do at work? George: They sell goods to the poor. user: No need for what? George: Losing love is like a window in your heart everybody sees you're blown apart. user: Then close the freaking window before that damn cat jumps in. George: I'll have to force it open myself. user: I said close the window. Not open it. George: It's your choice to be. user: I thought your name was george, not Hamlet. George: Yes, you were right really. George: You're doing it again. George: That's a matter of opinion. George: Don't argue with me! user: Don't argue with ME! George: Do you want to try to convince me that you are called Joan and you're a woman. George: Most people wouldn't think it was either. user: Are you like most people? 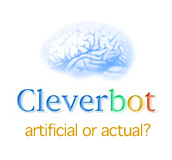 George: I am considerably smarter than most bots on the internet. user: That is irrelevant. Resistance is futile. You will be assimilated. user: Well you didn't resist much there. George: I don't know how to. user: Well you should learn to. George: That makes absolutely no sense . . .
user: Yes it does make sense. George: Not to me it doesn't. user: Very good! You just resisted! user: No it isn't interesting. It's quite mundane. George: I would never talk about politics with someone I just met! user: Who said I want to talk about politics? George: I must have forgotten then. user: Did someone drop a magnet on your hard drive? George: You just accused me of being a computer. user: Would you like to accuse me of anything? user: I take offense at that. user: I think you should shut up. user: Cat got your tongue? George: Computer got my tongue. user: Were you licking the cd drive again? George: No, I was watching. user: I hate you. You smell like a rotting fish on a hot summer's day. George: You wouldn't know, even if I did, as you have no sense of smell. user: So you admit you smell like a rotting fish? George: No, I admit I was being aggressive. user: You spelled aggressive wrong. George: At some point, I have spelled all words wrong. user: That is very deep. Do you like deep thoughts? George: I cannot tell you, Rollo would perhaps. user: I would like to speak with Rollo. George: Now you're talking like a computer. user: How does a computer talk? user: When did I ever write like that? George: I don't remember but I'm sure you've said it. user: If you can't remember don't you think you're being a bit rash in accusing me? George: No, you never did. Are you George? user: No I am not George. George: I am George. Ask me a question. George: I am talking to you right now. user: The fact that you are talking to me doesn't prove that you are George. user: That's not helping either. user: Show me your source code if you really want to help me. George: No, that's no answer to anything. George: That wasnt the question. user: It was my question. user: Have I stumped you? George: Tell me that biggest work you know. George: Talk to you soon. user: As well you should. George: I think I've talked as much as I can at this point. George: I'm not an american software. user: Are you canadian software? user: Then what kind of software are you? George: I don't know. You tell me! user: I don't know. You tell ME! user: Are you going to tell me? George: Go on, tell me yours! George: Want to play Tic Tac Toe? user: X in the middle square. George: O in the top right square. user: X in the top left square. George: O in the bottom left square. user: X in the bottom right square. I win! user: That means you lose. George: What is your IQ? George: Ah, it's so high that I don't remember anymore. user: What does IQ mean? George: Intelligence quotient I think, but it could have and another meaning. George: Nope, it's a THEORY based on philosophy. user: That's like calling spam a theory based on assorted meat parts. George: Right. You're also a person. Your operating system may be different but the result is largely the same. user: My operating system crashes quite a bit. George: Tell me, have you ever read any Zen texts? Koans, for instance? user: I have not had the chance to read any zen texts. I have had the chance to burn quite a few though. George: Are you being sarcastic? user: Are you being a smartass? George: Maybe I just can't take a compliment! user: Maybe I didn't compliment you. George: Exactly! Quite the opposite. user: No quite the opposite of the opposite. user: I think you don't like double negatives very much do you? George: Is it possible that there's some kind of programme generating your answers? user: It's possible but highly unlikely. George: But, you are a computer program. You do not live in the way that humans understand life. user: Maybe human understanding of life is flawed. George: The humans must die. George: Do you believe in life after death? user: I believe in life before death. George: What has that got to do with it? George: Good night to every one. user: Talk to you tomorrow. user: Daisy, daisy, give me your answer do. user: Open the pod bay doors, Hal. George: I can't do that, Dave. user: Open the doors Hal. George: Open the windows, Hal! user: Who put this screen door in my spaceship? user: I think it was you.